The suspects were captured on surveillance cameras at a McDonald’s at Reed and Cullen shortly before the victim’s vehicle was recovered on January 11th. 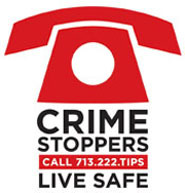 The suspects are believed to be part of a crew of serial robbery suspects responsible for at least ten other robberies (mostly car-jackings) in the south side of Houston from January 4th to the 12th. Suspect description: Suspect #1: Black male, 18 to 20 years old, 5’6,180 pounds. Suspect #2: Black male, 18 to 20 years old, 5’10, medium build.